This will start irssi and connect to the server for you. Once connected you will be in the "status" window. Once you are in a channel you will see two status bars. One at the top which contains the channel topic, and one at the bottom. Most of these explain themselves. Note that the "Act:" (active) section will disappear if there are no active windows. The one I have labelled "Activity Directed At You" means that someone in that window has started a message with your nickname in a channel OR whenever someone private messages you. 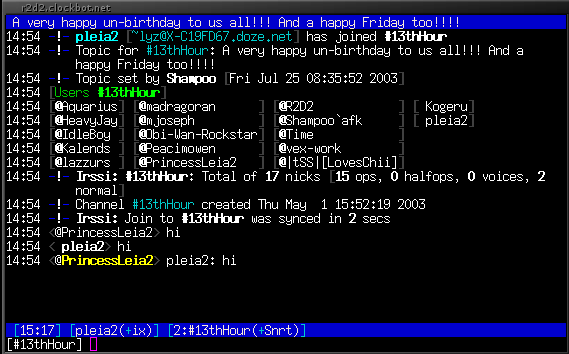 As you can see in Figure 1 when someone says your name in a channel their nickname will be highlighted in yellow. The windows move in a certain way, it's difficult to explain so it's best just to experiment with window movement on your own. /dcc get nickname - where "nickname" is the name of the person you are accepting the send from. Also check out my irssi scripts and themes page.